Miss Jay: and Winifred is to be engaged as understudy. Pauline Fossil: [starts to say] What? Winifred: [interrupts] When I finished my dance, people clapped! Nobody clapped her, there was just silence! Miss Jay: Dance is important, but Pauline looks right for Alice. Winifred: She looks right for everything, she always will! Q: Is "Ballet Shoes" based on a book? Q: Were Doctors Jakes and Smith lesbians? 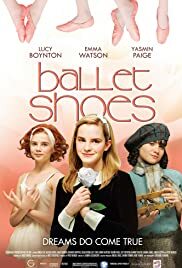 Q: Why is the movie/book titled "Ballet Shoes"? This reminded me of the Sunday afternoon dramas that the BBC used to show when I was young. There was nothing to dislike about this; it had charm, an improbable story, over-the-top characters and a real feel of the period it was set in - the thirties. There were lots of familiar faces; it was good to see Peter Bowles back on TV and anything with Victoria Wood has to be good. Emma Watston sustained the reputation she built up in the Harry Potter films - she is definitely going to be a big-name actress in the future. My personal accolade of Best Actress, however, went to Yasmin Paige who played Petrova, the girl who wants to be the aviator. You heard it here first folks - she is going to be a famous actress - and I'm not even her mother!